Too often business smarts and creative ability operate in separate departments, united only at office parties and brainstorming sessions. But we live in a time that requires leaders with a combination of these talents. Leaders who not only possess strategic foresight and analytic skills, but also see every business challenge as a design problem—solvable with the right mix of imagination and metrics. We call these new leaders DEOs, short for Design Executive Officer and a play on CEO. Just as we took our cues from MBAs and the military in casting the ideal CEO of the 20th century, we can look to designers—in that term’s broadest definition— to model the leadership traits we need now. DEOs are not necessarily design practitioners, but they possess characteristics, behaviors, and mindsets that designers commonly use to innovate in unpredictable, fast-moving, and value-charged conditions. Startup founders, and a growing number of progressive corporate leaders who emulate them, have learned to lead using these abilities. They realize their success rests on attracting and coalescing stakeholders who share their vision, goals and values. Traditional “command and control” directives don’t work for them, nor do strategies focused too intently on bottom-line profitability. Instead they must build appealing corporate cultures that attract and retain talented employees. They must assemble teams who collaborate easily and effectively. They must create resilient organizations that value expertise but make room for failure—organizations able to evolve with the changes taking place all around them. 1. Are you comfortable taking risks on a regular basis? 2. Do you look forward to making changes in your company, your industry or yourself? DEOs aren’t troubled by change; in fact, they openly promote and encourage it. DEOs regard the ability to change quickly as a competitive advantage and seek opportunities to use it. They love to experiment and iterate their way to an improvement. They try to think and act differently than others, and are comfortable disrupting the status quo if it stands in the way of their dream. 3. Are you able to problem solve in a systematic manner? Despite their desire to take risks and make change, DEOs are systems thinkers who understand the interconnectedness of their world. They know that each part of their organization overlaps and influences another. They respect the unseen connections that surround what’s visible and take these into consideration when solving problems. 4. Can you integrate intuitive and analytic decision-making? DEOs know that the best decisions are informed by both intuitive and analytic analysis. A DEO can intuitively sense when something’s wrong, then use assessment tools to figure out where the problem lies. He or she can analyze broad opportunities in the market, then use intuition to discern elusive, but crucial specifics. 5. Can you easily empathize and connect with others? 6. Are you driven to take action? 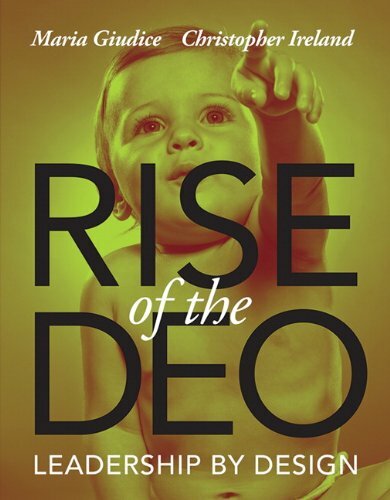 Our book, Rise of the DEO: Leadership by Design, identifies and explores the qualities ­ and virtues of this new breed of leaders. It describes the skills they use to collaborate and the conditions they construct to support creativity. We profile business heads who exemplify this new ideal and show how they and their companies have benefited from this approach. As with the DEOs we admire, this book combines well-researched data with beautifully imagined, thoughtfully presented insights. It is designed to inspire, inform and encourage everyone who’s interested in solving problems and making change.